This is what the CNN website looked like on July 30, 1996. Bill Clinton was facing a re-election battle against a new type of right-wing opposition, listeners of Rush Limbaugh who called themselves, "Dittoheads" and shouted out against anything they considered "Liberal." Just like with Obama, from Clinton's first day in office the top priority of Republicans was getting rid of "Slick Willy". 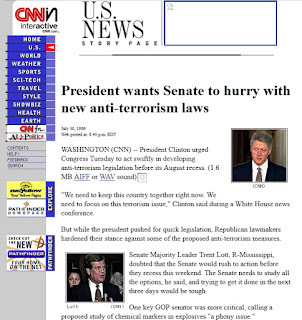 If you click on the above picture, you can read the article about how Clinton wanted to pass an anti-terrorism bill, but the Republicans had concerns with "privacy" issues and were just generally being uncooperative, the way they had been about health care reform and everything else he tried to accomplish. When Clinton was re-elected, Priority One remained getting rid of Clinton. Scandal after scandal after investigation and then impeachment, with Rush Limbaugh and Fox News leading the outrage. All the while, Al Queda was organizing and training and preparing for an attack that would make these same Republicans DEMAND the most invasive piece of legislation of our time, the Patriot Act. Now: Here is the choice for Republicans. You can continue to be led by men who have never been elected to an office, like Karl Rove and Grover Norquist, you can continue to take all your cues from Fox News and Rush Limbaugh, or you can write to your legislators and tell the media that you want new roads and bridges built, health care reformed, and the Republican Party must tell Grover Norquist to take a hike. They must break their pledge with this Washington insider to never to raise taxes, especially on the very wealthy. Please do not spend the next four years looking for ways to "get" Obama. Please encourage and reward bipartisanship, and quit punishing Republicans who are willing to work with the other side (as in, don't demonize Chris Christie... thank him). There is so much we can get done in America... but it will take a lot longer if we have to play the "Let's reject every single thing that a Democrat wants to do, whether it's right or wrong!" game. Like we learned on September 11, 2001, bickering about politics instead of taking serious matters seriously can have catastrophic consequences.